The 2018 dig will run from Tuesday 26th June until Friday 3rd August and visitors are very welcome from Sunday to Thursdays between 9am and 5pm. We’re not usually on site on Fridays and Saturdays, so please don’t visit then. The first few days will be opening up the site so there won’t really be anything to see (apart from tired and sweaty diggers) until Sunday 1st July. Don’t leave your visit too late as the last few days will be backfilling the site, so if you come right at the end of the dig you’ll likely not see anything (except more tired and sweaty diggers of course). See below for details of special ‘Swandro Sunday’ and Viking Camp events extra to our regular opening hours – we are always happy to give you a free site tour, whenever you visit. Donations are of course always welcome! To make it easy for people to visit Rousay and the dig as foot passengers on the ferry we are holding a series of ‘Swandro Sundays’ on the 1st July, 8th July, 15th July, 22nd July and 29th July, when there will be FREE transport from the pier to the dig. A minibus will meet the 10.45 am and 11.55 am departures from Tingwall, and will provide a drop off/pick up service from the road above Westness Farm, where by kind permission of the landowner (on our special Sundays only) you may walk along the farm track to the site, which is about 1km/0.65 miles, with a moderate slope. You may also be dropped off/picked up from the car park above Midhowe tomb: in either case the minibus will take you back to the pier n time to catch either the 3.20 pm and 5.30 pm departures from Rousay. 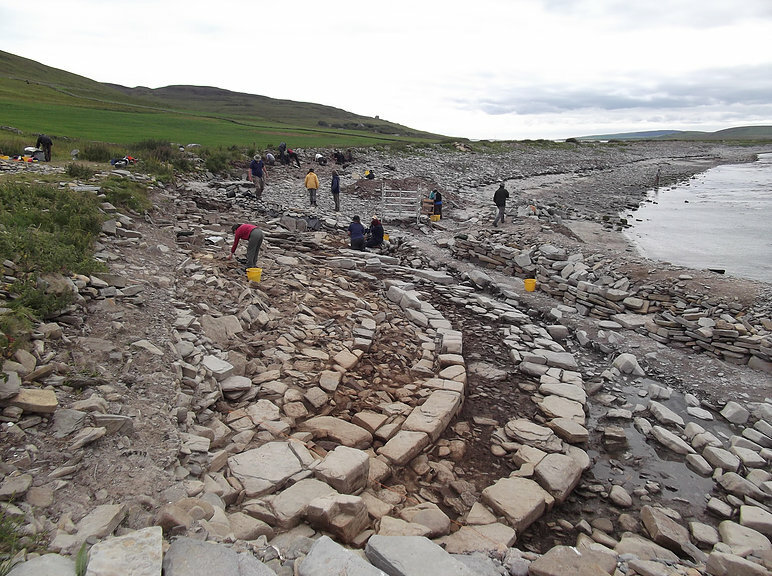 (Please note that on Sunday 1st July only the first tour off the 10.45 boat has been reserved for members of the Orkney Archaeology Society). We will have Living History demonstrations on site too, as well as free site tours running all day. You can combine a visit to the excavation with a walk along the shore to Midhowe tomb and broch, which takes you past the remains of the chambered tomb at the Knowe of Rowiegar, Skaill Farm, St Mary’s Kirk and the Norse fortified tower at the Wirk. If you are visiting us on the 22nd July you will be able to visit the dig at Skaill Farm during their open weekend as an added bonus. On Saturday the 14th of July from 11am to 5pm we are holding an event at the Rousay community school, with a Viking camp and cookout in the community garden – come along and sample a Viking lamb stew with bere bannocks, and ‘Meet the Specialists’ in the school hall. Free entrance, raffle, all are welcome. A minibus will meet the 10.45 am and 11.55 am departures from Tingwall, and will provide a pick up to connect to the 3.20pm and 5.30pm departures from Rousay back to the Mainland. Bus Route 6 links the Tingwall pier with Kirkwall – If you come across as a foot passenger or as a cyclist the site is about 6 miles from the pier. There is a public bus service on some days and a taxi/private hire service 7 days a week to get you from the pier head to the site. To get to the dig please ask Richard to drop you at the car park (or park at the car park if you’re in a car) for Midhowe chambered tomb: if you look down the hill along the coast to the left you will see the excavation. The dig site will be signposted from the bottom of the hill. WARNING: the hill is very steep and should not be attempted if you have mobility issues or health problems – it’s a long way back up the hill if you get stuck! Please walk down to Midhowe then turn left and walk along the shore, keeping to the seaward side of the stone dykes – follow the signs. This is a pleasant walk in itself, taking you past the remains of South Howe broch, Brough Farm, The Wirk, St Mary’s Kirk and Skaill Farm (where an excavation will be in progress from the 9th to the 22nd of July), then past the Knowe of Rowiegar and on towards Swandro. You can walk along the edge of the storm beach cast up by the Atlantic and there are many wild flowers along the way, together with a large seal colony along the shore. The landowners at Swandro are extremely supportive of the excavation and we could not proceed without their willing cooperation. Please respect their land and livelihood and DO NOT take a shortcut across the fields: grass is a fodder crop and can be damaged by many feet. Please walk along the shore and KEEP DOGS ON A LEAD AT ALL TIMES due to grazing livestock. Refreshments can be obtained at the Taversoe Hotel which serves hot food seven days a week, whilst the Crafthub at the pier serves tea/coffee and cakes, and sells a range of local crafts. If you can’t visit us then we have more information for you and you may also subscribe to our free email newsletter to keep you up-to-date with the dig.